Most of what we write here at SpecialOperations.com deals with the training side of the house. What you’ll need to do to pass the Selection and Assessment courses. But today we’ll leap ahead to the second phase of the Special Forces Qualification Course or SFQC for Special Forces students and talk about SERE training. Since the Army revamped the training and made SERE a part of the SFQC about a decade ago, every prospective SF soldier goes thru it before their patrolling phase (Phase III). And it makes more sense, in the old days, candidates would go through a survival portion of the training and then after graduation, selected members would get tasked to attend SERE. Now everyone does and it allows training for the entire force. Breaking the Myths of What SERE Is and Isn’t: SERE School is a training program to teach military members, Department of Defense civilians and military contractors survival skills, training in evading capture and the military’s Code of Conduct. But we must get the BS out of the way. Like everyone else, we read what is out there in social media. And the myths that are perpetrated about SERE rival those of Selection. You’ve seen all of these myths and some of you candidates have probably already repeated them without realizing they are false. Myth #1, the Cadre are allowed to break one bone in your body: Really? I was going to use more colorful language but suffice to say, that this is total horse dump. I’ve even seen the “It may just a small one like a pinky”…. Jeez. No one is breaking bones out there, folks. We don’t do it to detainees in Gitmo, we’re not going to purposely break the bones of future Special Operations troops. Myth #2 SERE is a “Torture” School designed to break you: Wrong again. It isn’t a torture school at all. It is tough, it will push you in ways you probably haven’t been pushed before and it isn’t fun. But when all is said and done, SERE is one of those courses that no one wants to go to but looks back upon it as a great learning experience. Treat it as such and learn from it. That is what is designed to do. Myth #3 Troops come out of SERE with PTSD and Psychotic: This one has to be my favorite. Most of the great unwashed who repeat this use the 24-hour rule after SERE is over as a means to justify this myth. It is akin to saying 1+1 = 6. After SERE is complete, students are given a 24-hour break to decompress before the out briefs are given. This is because the final week or more, the candidates get very little sleep and they are generally hungry as hell. The out briefings are important teaching points and the students must retain them. If you get PTSD from SERE school, perhaps you need to rethink a career in Special Operations and take up something other than combat arms as a primary MOS. My officer class was released at the conclusion of the course and we met that night en masse at Chi Chi’s in Fayetteville. The staff at the restaurant was alarmed, not our psychotic behavior but at how much Mexican food was put away as we put on a serious feed bag that night….but PTSD? No. Level-A is initial-entry-level training that all soldiers, enlisted and officers receive upon entering the service. It provides a minimum level of understanding of the Code of Conduct. Level-B is designed for personnel whose “jobs, specialties or assignments entail moderate risk of capture and exploitation.” DoD 1300.21 lists as examples, “members of ground combat units, security forces for high threat targets and anyone in the immediate vicinity of the forward edge of the battle area or the forward line of troops.” Current combat operations have shown that practically everyone deployed in theater falls under this category. Consequently, demand for Level-B training has proliferated exponentially, and it has become mandatory for most deploying forces. Level-B is conducted at the unit level, through the use of training-support packets containing a series of standardized lesson plans and videos. The SERE Level-C training facility at Camp Mackall is one of only five facilities within the DoD that is authorized to conduct Level-C training. The Air Force conducts training at Fairchild AFB, Wash., and the Navy has facilities in Brunswick, Maine, and at North Island, Calif. The Army Aviation Center at Fort Rucker, Ala., has their own another Level-C facility for aviation pilots in the Army. SERE was developed by LTC Nick Rowe because, during his five years in captivity as a POW of the Viet Cong, he saw difficulties in how the troops were being trained. It used to be “The Big Three” (Name, Rank and Serial Number) and nothing more. But while a captive, Rowe saw that he had to change that outlook and approach things in a different manner or else he’d suffer the fate of CPT Rocky Versace, who fought the Viet Cong at every turn and so incensed his captors, that he was executed by the Cong. And with minor tweaks, the course has remained largely the way he envisioned it. 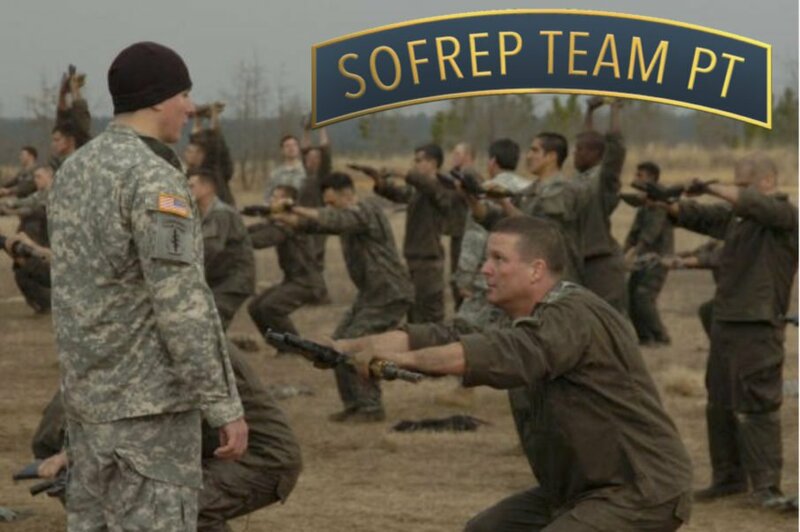 The SERE course spans three weeks with three phases of instruction, with the first phase consisting of approximately 10 days of academic instruction on the Code of Conduct and in SERE techniques that incorporate both classroom learning and hands-on field craft. One of the highlights of the course is that the cadre brings in former POWs to talk to the students about what to expect and how they coped with being a captive. Our class had Dan Pitzer who was a POW with Col. Rowe in Vietnam. Suffice to say, you could have heard a pin drop during his presentation. The second phase is a five-day field training exercise in which the students practice their survival and evasion skills by procuring food and water, constructing small evasion fires and shelters and evading tracker dogs and aggressor forces for long distances. This was by far the best part of the course. Trying to defeat the tracking dogs is not easy. And to dispel another myth, tracking dogs don’t bay while on your scent. You won’t hear a peep from them until they can see you. Hollywood-perpetrated this one as a means of building suspense on film. It isn’t very suspenseful when the escaped cons from the prison farm stop and hear silence. Once you hear the dogs baying, it is too late. One morning we made it to our hide site, camouflaged it and I was already sacked out asleep when I was woken by a basset hound licking my face. The final phase takes place in the resistance training laboratory, a mock prisoner-of-war camp, where students are tested on their individual and collective abilities to resist interrogation and exploitation and to properly apply the six articles of the Code of Conduct in a realistic captivity scenario. That’s as far as we’ll go in that phase, as the school house has some strict rules on that. The course finishes with a day of debriefings in which the students receive individual and group feedback from the cadre. These critiques help students process everything they have been through to solidify the skills they applied properly and to correct areas using constructive criticism. SERE is an excellent course that each of the services has tailored to meet the needs of their particular mission. But the core elements for each service remain the same for each course. It is a great learning experience and prepares you as best the services can what a survival situation may entail in the real world. “Boots, boots… There’s no discharge in the war…” This will eventually make sense to you, for the grads of SERE, no explanation is necessary.